8 a.m. comes early when it’s Saturday and you’re nervous. Dor was right on time the morning of our organ studio trip to New Haven, CT. As my first group outing with Boston Organ Studio, I wasn’t sure what to expect. I’d joined the group in November, attended two studio classes, and understood that I was encouraged to play each organ we visited. But intimidated by the talented group of students, and easing back into playing after a ten-year hiatus, I was absolutely not ready to do that. Thomas Murray pointing out details in the stained glass. After a pleasant ride with Dor and Khristian Erich, a struggle to find parking, and a much-needed coffee stop, we met up with the group to start our day. Our first stop was the gothic inspired Christ Church, where we met Professor Thomas Murray, the principal organist at Christ Church, Professor of Music and University Organist at Yale. The sun was streaming through the Kempe Company’s gorgeous stained glass windows – the wheat sheaf signature hidden in the corners – illuminating the empty church and the delicately carved wood trimming the room and framing the pulpit. Ok, maybe I’ll play. I think I remembered both shoes. 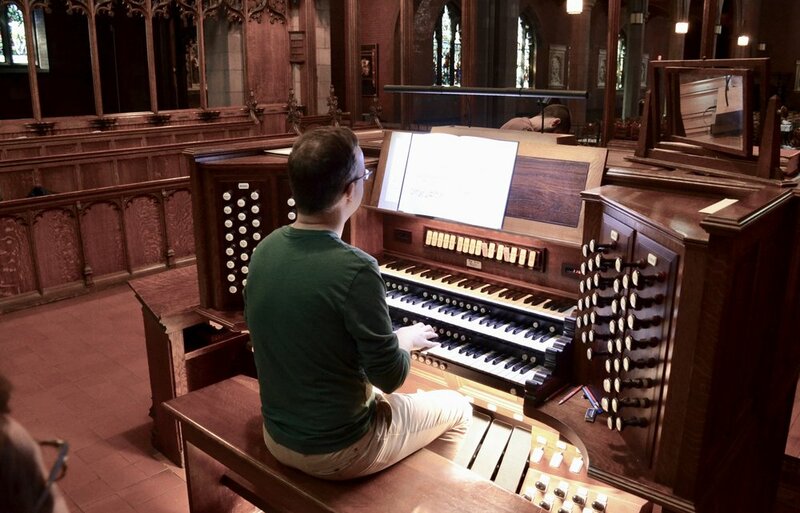 Adrian Cho at the console in Christ Church, New Haven. Given my background, I found the positioning of the organ interesting. The console sits in the chancel with the majority of the pipes sounding into the organist’s left ear. The exception was the high-pressure Tuba, which faced out towards where the congregation would sit. I took a moment to sit in the straight-backed wood chairs, and took in the music. I listened to gentle, melodious pieces played with flutes and strings as well as boisterous ones using horns and reeds before wandering back to the front. With Chris gently coaxing me out of my comfort zone, I gave in and played, ultimately thankful for his encouragement and breaking my initial fear. I guess that’s why he’s the teacher. We stopped in a small music school hangout for a quick lunch before walking briskly to the Yale campus for our next stop. 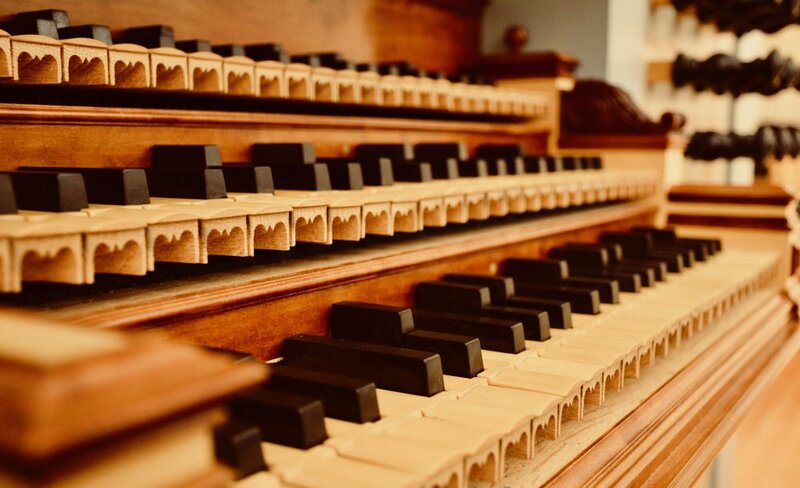 If it’s true that Mozart once called the organ the “King of Instruments,” he was most definitely talking about the one in Woolsey Hall. The focus of the expansive, 2,500+ person hall is the Newberry Memorial Organ, one of the most renowned romantic organs in the world. The Newberry Memorial Organ, Yale University. Built in 1901 and named for John Stoughton Newberry, whose family financed the building of the original Hutchings organ, the renovation by Steere in 1915, and the rebuilding by E.M. Skinner in 1928, the Woolsey organ was the most beautiful organ I’ve ever seen or heard. The 12,641 pipes, 167 stops, 197 rank, electro-pneumatic, remote combination action instrument has a painted gold facade with intricate blue floral designs. 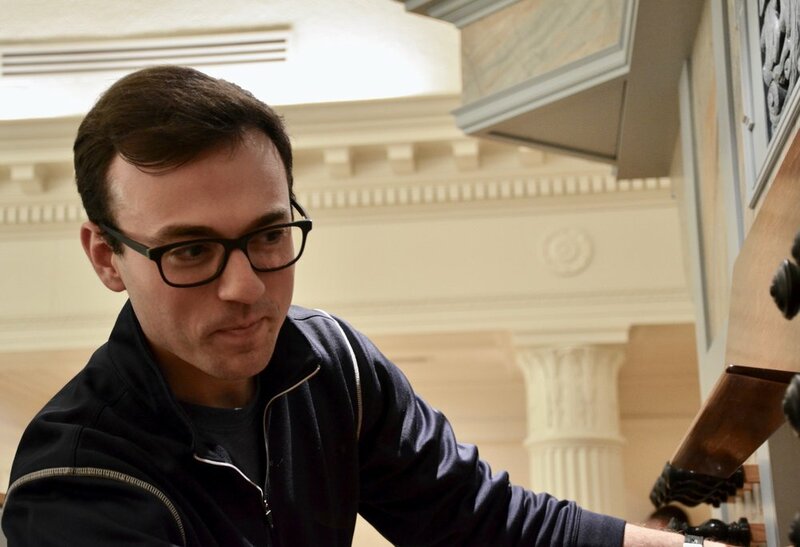 We met Joe Dzeda & Nick Thompson-Allen, Yale’s organ curators, who shared how they cared for the organ, and how Nick’s dad had been the caretaker before them. They described how similar organs of this genesis had been renovated beyond recognition, but this one was well cared for and essentially unchanged since 1928. They explained that the humidity in the summer enhanced the acoustic while dry winter weather dampens the sound, and how a different technique would be needed in each situation. The seats behind our group were filled in as they spoke (where did these people come from?). Christian Lane at the console in Woolsey Hall. Nick Thompson-Allen then took us on a tour of the inner pipe chambers and relay rooms. The wood and metal pipes ranged from only a few inches in length to four or five stories tall. We all squished in the small rooms, up a steep ladder, and then up a tinier steeper one, surrounded by pipes on all sides. (Must maintain sure footing because falling onto these tiny metal string pipes or fancy wooden flute ones would both hurt terribly... and likely ban me for life). 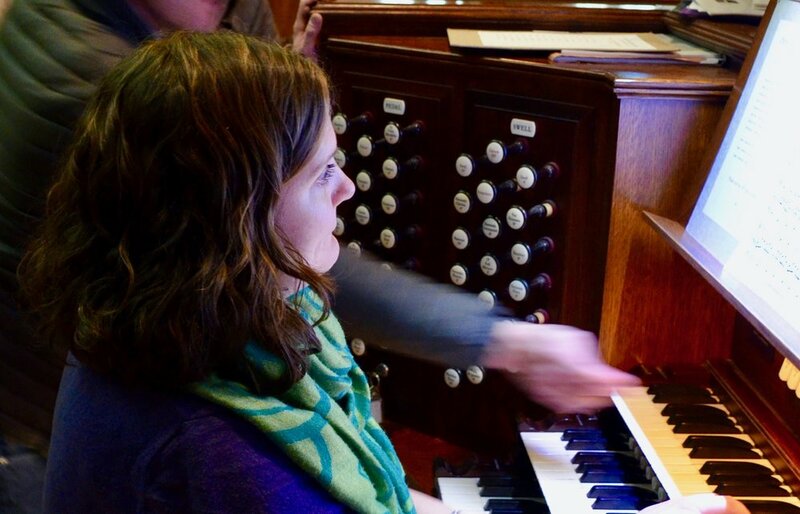 Chelsea Keating plays the Newberry Organ in Woolsey Hall. Nick explained the inner workings and mechanics of the organ before we cautiously returned to the console to each take our turn playing the massive instrument. From improvising the Olympics theme song to a full Max Reger piece, Christian guided us through choosing stops. There were so many stops to choose from that it could be overwhelming. 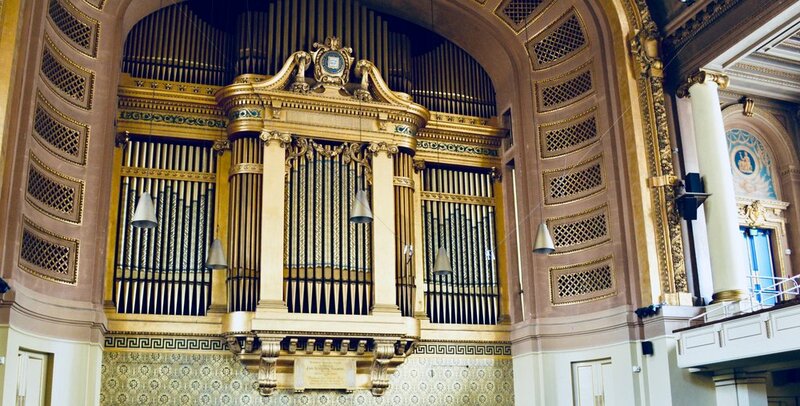 I would love — as I think all of us would — to have hours to play this organ, and can’t wait to go back (we’re going to do that, right?). 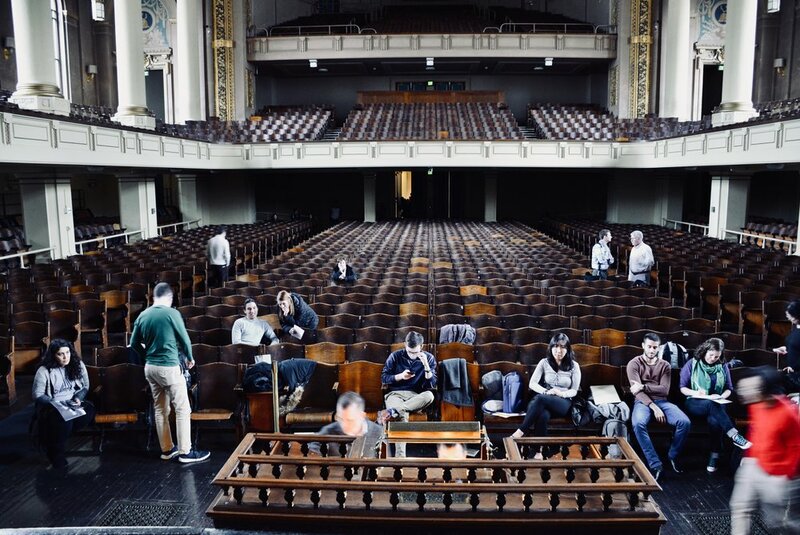 We then headed to the Institute of Sacred Music, which joins students from Yale School of Music and Yale Divinity School. 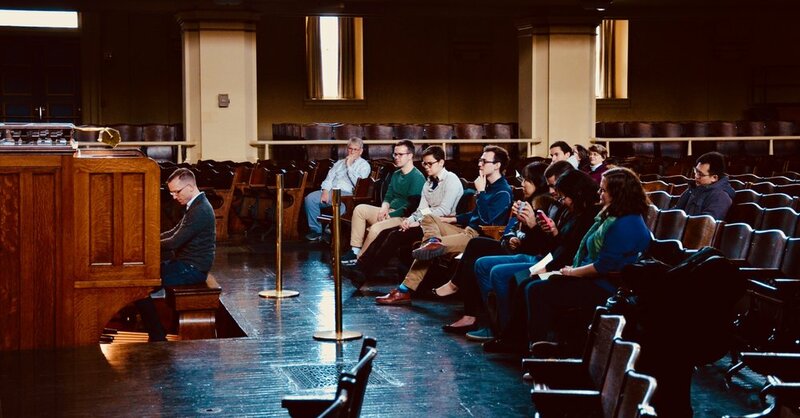 We were introduced to the energetic and talented Martin Jean, Director of Yale’s Institute of Sacred Music, Professor of Organ, and Professor in the Practice of Sacred Music. Our first stop was the Organ Studio, a large practice room that housed a modest mechanical stop/key action organ built by Martin Pasi, with around 12 stops made of lead pipes, as well as a harpsichord. A colleague practicing played a short piece for us to demonstrate the sound of the instrument. The Taylor & Boody keydesk in Marquand Chapel, Yale University, with sub-semitones. 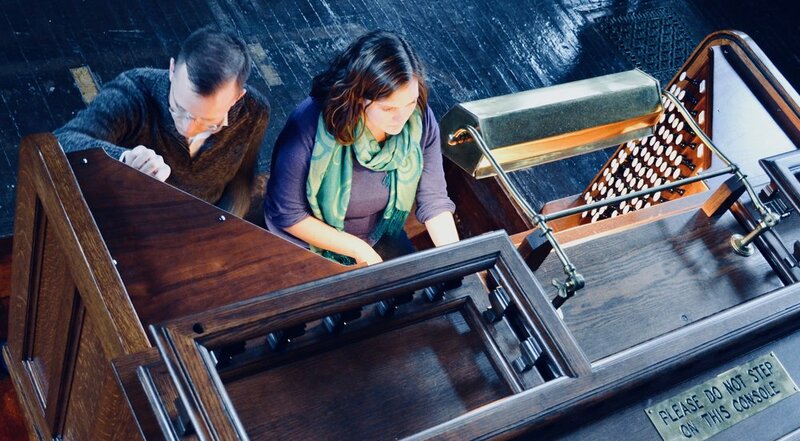 We passed several organ practice rooms before our second stop at the Marquand Chapel, which houses Taylor & Boody’s Opus 55 organ, installed in 2006/2007. The organ was painted blue, with sections of a grey, orange, and blue marble façade. Delicately painted calligraphy labels each of the stops, which weren’t laid out in a way that makes sense to this organist, but were instead positioned for the convenience of the organ itself. I’d never seen this type of organ before. It is tuned in meantone temperament, meaning that the fifths are irregularly narrowed in order to favor major thirds, and that the accidental keys are split to be sub-semitones. There’s one key for an e♭ and then an even higher raised key for a d♯, though normally they’d be the same note. The note you use more often is in the front. This unique looking organ is one of only a few in North America. Joe Dzeda had said previously that every organ has something valuable to teach you, regardless of how you feel about it. This one is specifically tuned for a certain repertoire of music, and though it looked far more complicated than I was ready for, I was eager to try it. 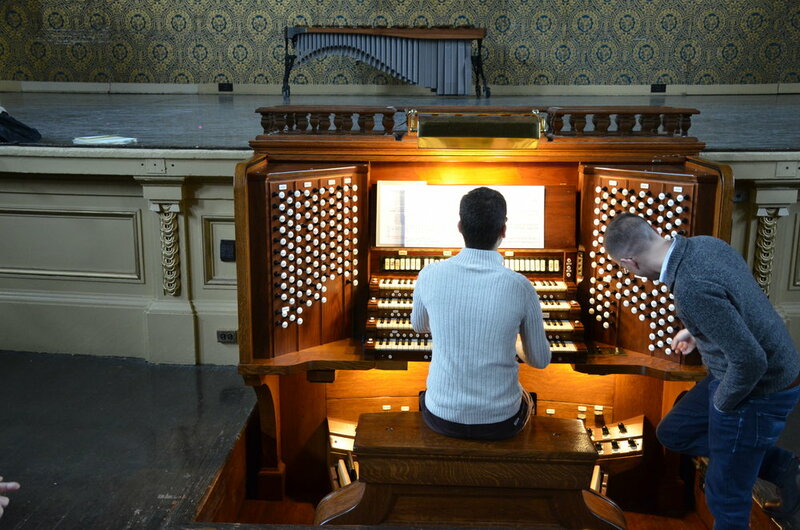 This 2,000-pipe organ also features a short octave keyboard. Martin Jean coaches Dor Amram on music of Bruhns. Martin Jean gave a mini master class, critiquing and complimenting Cho’s Sweelinck Chromatic Fantasia, Dor’s Praeludium in G Minor by Bruhns, and Grace’s Buxtehude Chaconne in E Minor, joyfully giggling and exclaiming “shut up!” when they did well. We then all took turns playing, each of us adjusting to this style of organ. I took a turn and found that being surrounded by pipes in an intimate space made it very clear when I hit the wrong accidental... d♯ and e♭ are definitely not the same thing! 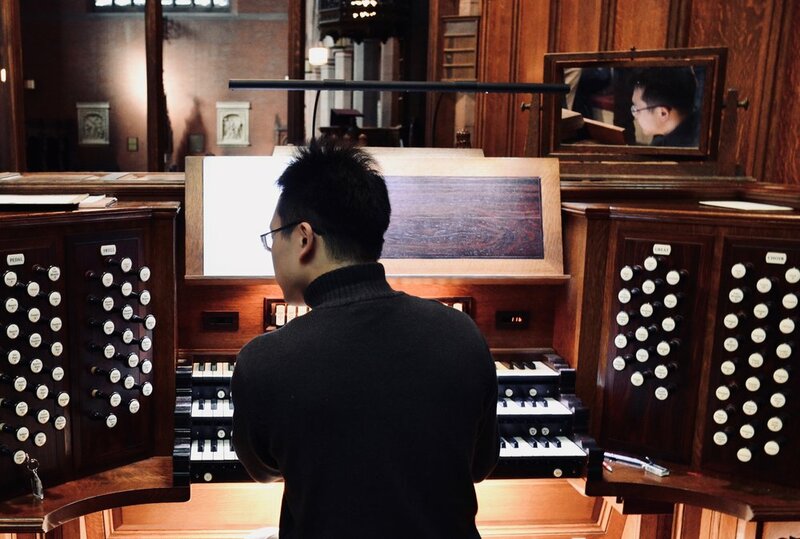 This organ was challenging but rewarding to play, sounding slightly different than the other two organs we’d played that day. It had started to snow by the time we left, walking to a trendy pizza place for a fun dinner with this spirited group. 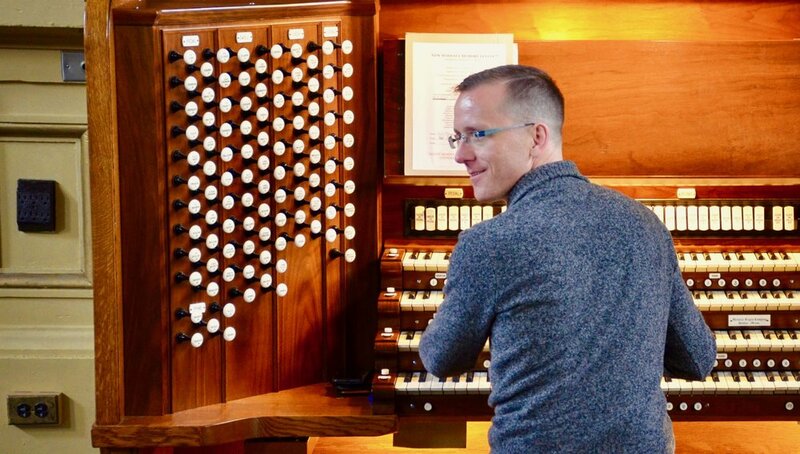 This trip was a turning point in my relationship with the organ. Mine had always been a solo one — playing for a service high up in the back of the church, or practicing in a dark hall, alone at night. Now I was with a group of supportive people who were equally excited about playing the organ as I am. The nearly three hour drive home in the storm gave me plenty of time to reflect on the day and get excited for our next trip. 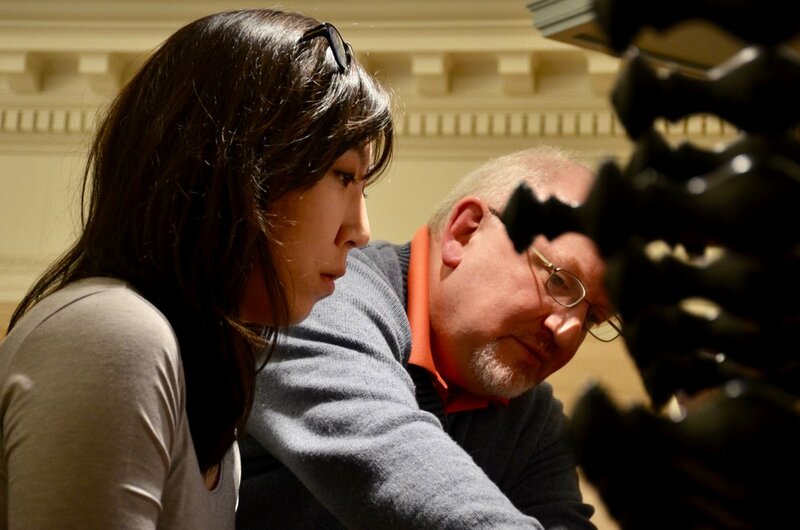 Organ Curator Joe Dzeda introduces the Woolsey instrument to members of Boston Organ Studio. Detail of the mean-tone Taylor & Boody pipe organ keydesk, with sub-semitones. Marquand Chapel, Yale University. Professor Martin Jean coaches student Dor Amram at Yale University. Emerson Fang is all smiles. Thumbs up from student Chelsea Keating. 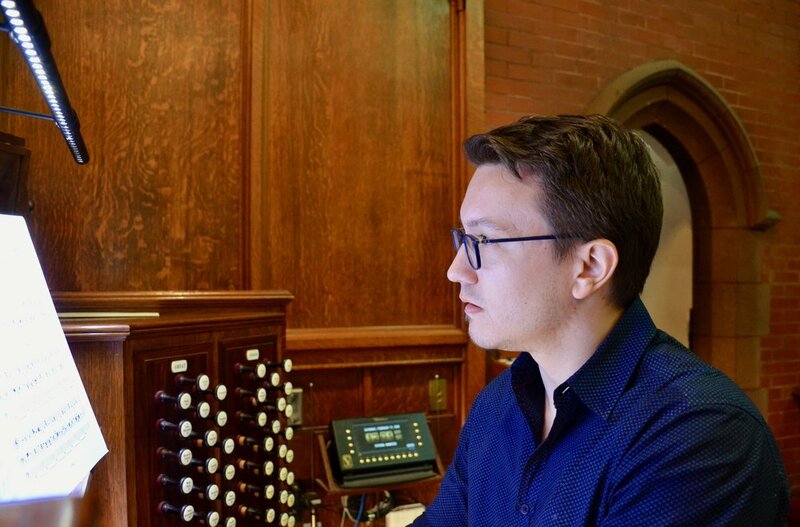 Joseph Srednicki plays Frescobaldi in Marquand Chapel, Yale University. 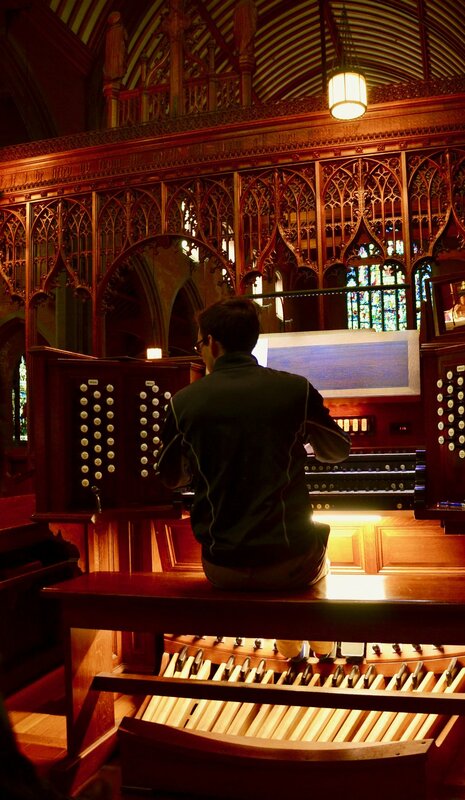 Kade Phillips at the console of the Taylor & Boody organ in Marquand Chapel.